Arguably the most valuable piece of Auburn memorabilia will soon be for auction. You’re not going to keep them off the mission field tonight! When it comes to individual excess apparel donations, Mangers On A Mission typically asks for at least 20 items. 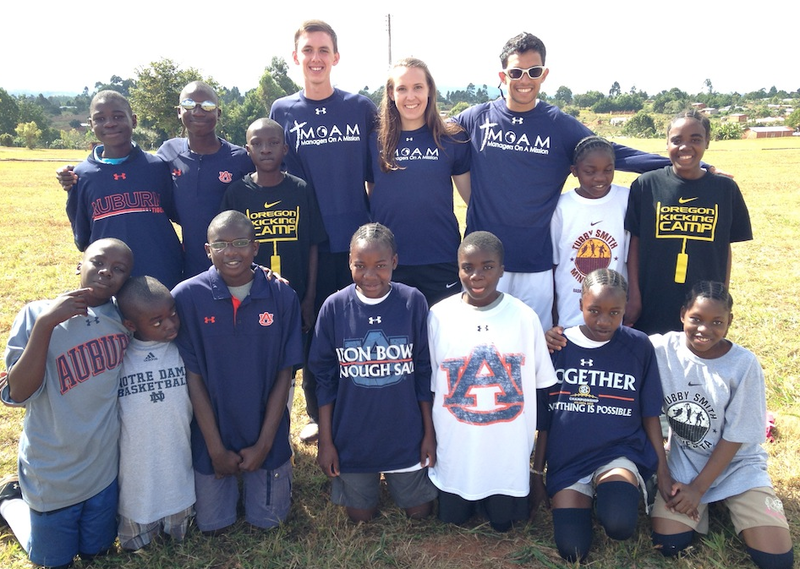 For Gus Malzahn, the young, faith-based charity was willing to make an exception. True, Malzahn probably could have spared several of his now iconic sweater vests. But the only one MOAM really had its eye on was the one that saw action in the greatest football game ever played. Boe saw up close and personal what happened to the The Football. 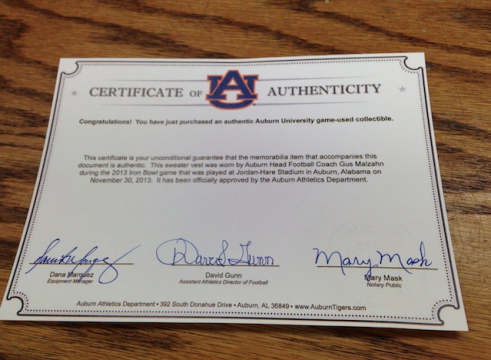 He served as an assistant equipment manager for Auburn during the 2013 football season and was on the field when the most valuable football ever to be used in an Auburn game became the most valuable football ever to be used in an Auburn game, or maybe any game. 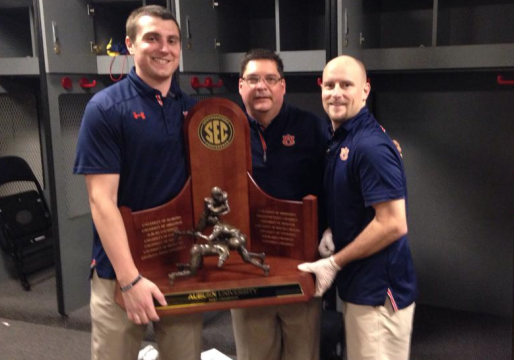 Thanks to then Auburn ball boy Andrew Kozub, it didn’t fall into the wrong hands. THE Football. Probably not for sale. A few days later, the instantly legendary piece of football memorabilia was appraised at $100,000. That’s a lot of plane tickets and building supplies—a lot of pretty much everything you need when you’re developing orphanages in Africa. Those contacts and resources provide MOAM’s primary funding opportunities. Some of the clothes and equipment the Minnesota-based ministry receives go straight to those Boe and Co. are trying to help. Scroll through the organization’s photo galleries and you’ll see kids in countries like Malawi decked out in Iron Bowl shirts, Oregon Kicking Camp shirts, Notre Dame basketball shirts, and, thanks to one of Boe’s first connection coups, Tubby Smith Basketball Camp shirts. When coaches switch jobs, they switch wardrobes, and when it comes to figuring out what to do with the dozens of T-shirts, hats, and jackets bearing the names and logos of their former employers, MOAM wants to be first, most obvious option. Boe was a student manager for the Gophers while earning a degree in Sports Management. Thanks to connections made while working as a graduate equipment manager at Virginia Tech, he also received a large donation from Hokies head football coach Frank Beamer. Boe (left) with Auburn Equipment Manager Dana Marquez–check out his sewing machine balloon!–and Asst. Equipment Manager Brad Rapacz after the 2013 SEC Championship Game. “You can lose perspective on how valuable some of those items can be,” Boe says. There’s no risk of that with the sweater vest MOAM plans to list in a couple of weeks. 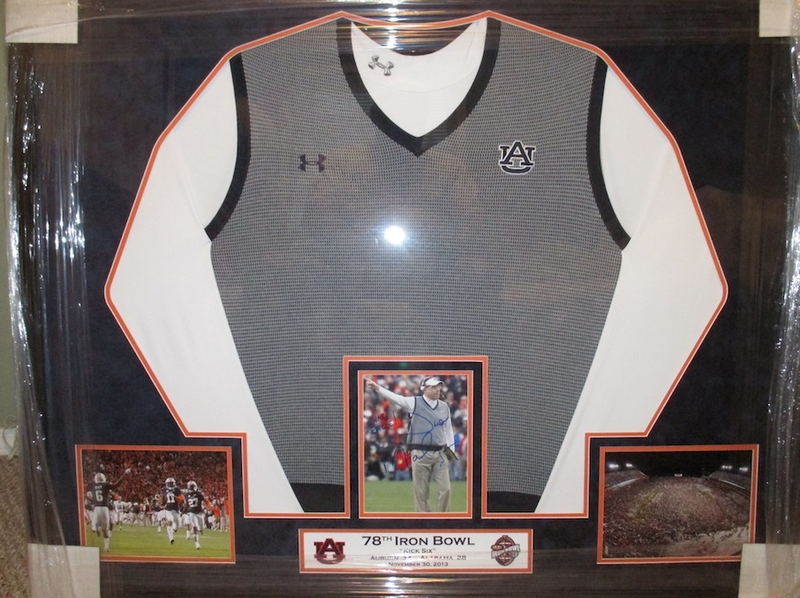 MOAM received the vest in April and sent it off to be framed along with a certificates of authentication as well as an autographed photo of Malzahn taken during the Iron Bowl. “We wanted to set things up the right way in terms of making sure that Coach Malzahn understood what our mission was, what we’re trying to accomplish,” Boe says. If the vest ends up going for anywhere close to the initial valuations—sports memorabilia dealers have given appraisals in the $50,000 range—they’ll be able to accomplish a lot. Related: Gus Malzahn’s hurry-up, no-huddle offense has turned Auburn into Ball Boy U. 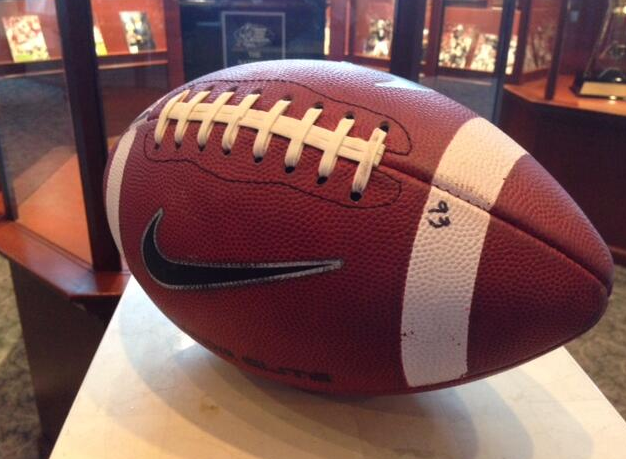 Prior to the Kick 6 (and the return of the missed kick), that football belonged to UA.